Our condo is a Saturday to Saturday rental with a 7 day minimum. sitting on the balcony. Welcome to paradise! We really enjoyed our stay at Dino's condo in Indian Shores. He was easy to communicate with, gave us lots of good information about the condo and even let us check in early! The view from the condo is unbelievable! The deck is large with ample sitting room and the ocean is spread out, right in front of you. The sunsets are awesome; right in front of the condo! We saw dolphins swimming and lots of different birds right from our balcony! The grounds of the complex are tropical, well kept and clean. The pool is warm and is located right on the beach. 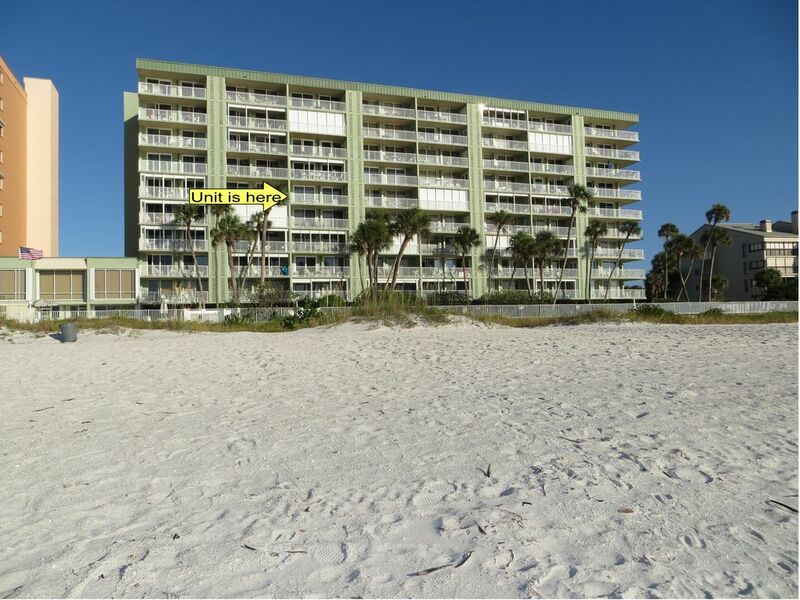 The beach is right out the back of the complex and you have white sand that goes on for miles and miles, perfect for long walks or bike rides. I highly recommend a beach stay at Dino's condo in Indian Shores! Great Location, Fun time had by all! We had a great week long visit. The Condo location was perfect, near lots of restaurants and ice cream stores, etc. near by. Spent lots of time on the beach, saw dolphins several different days. The condo itself was very clean, as well as the entire complex. Would love to visit again sometime. The sunsets are amazing! This condo was everything my husband and I could have hoped for. The views from the balcony are spectacular! We were able to watch beautiful sunsets over the ocean every single night we were there. After the sun went down we sat out on the balcony, sometimes until 12 or 1 in the morning just listening to the waves crash on the beach. Though sunrises happen on the other side of the building, waking up to the view of the ocean as dawn is approaching was breathtaking. The surrounding property, the beach and the pool were all perfect. Neither the pool or the beach was every too crowded so it's like you have your own little piece of paradise while you stay here. The condo was well stocked with everything we could need from dishes to towels to beach gear. Though we didn't go there to spend time inside we also enjoyed plenty of the TV/BluRay. Dino and Ingrid are also extremely pleasant to communicate with. Prior to our arrival we had detailed instructions about how to access everything we could possibly need and Dino made it very clear that we could reach out at any time if we needed to. If you are looking for a place to relax and just enjoy your time, this is the place to be! Lovely clean apartment , well equipped in a lovely location. Ice cream store across road selling lovely ice creams. Owners easy to deal with with great information sent prior to arrival. Would definitely rebook and would recommend to any one wishing a relaxing holiday on the beach. Especially enjoyed the watching for dolphins from the balcony and the sunsets!! Wonderful, fully furnished condo with perfect view and easy access to clean, uncrowded beach. Entire experience was terrific. Cheaper than hotel and 100 times better. My family of five easily fit. Highly recommend.